Feng shui birth elements are determined by your birthday and may help you understand some of the influences that shape your life. For greater detail, you'll need a Ba Zi analysis or use a Feng shui birth element calculator. The Ba Zi (also known as the Four Pillars or Eight Characters) birthday analysis determines your weak and strong elements. This can guide you in making good feng shui choices and show you areas in your home that may have a negative influence on your life. Fill in your birthday to find your feng shui element and what it means. The element assigned to the year in which you were born has an influence over you and should be considered along with your animal sign and element found in the earthly branch. Use wood décor objects to enhance your natural element of wood. This includes using it in your best directions of east and southeast (both ruled by wood element), such as wood furniture and wood objects. In addition, the water element nourishes the wood element, so you can add a tabletop water fountain or fish aquarium in on of these sectors, except for the kitchen or bedroom. You will find living in a forest or wooded area and/or near water enhances your personal element power. You are interested in most health-related and enjoy good health. You are very happy being out in nature and especially surrounded by trees and forests. With a wood element, there is a tendency towards great prosperity and wealth. The best directions for you is the East and Southeast. Use these directions for activities of sleeping, eating, studying and/or home office location. Yin wood favorable elements are water and wood. Add the water element to your home décor to support the yin wood element. Yang wood favorable elements are metal and fire. Add both metal and fire elements to enhance the yang wood element. Brown and green are your best fashion colors. You can use these to enhance personal element power in both attire and home décor. The water element guides you and can be used to your advantage. One of those ways is to add a water feature, such as a tabletop fountain or fish aquarium in the North sector (ruled by water element). You can also live near water to further enhance your personal element power. You are a calm person with fresh new ideas. You love being around and in water. Water brings a sense of calmness to you like no other element in nature. This is where you feel most at home. You are naturally drawn to the North direction. Use this direction to benefit activities, such as sleeping, eating, studying and/or home office location. Yin water favorable elements are metal and water. Add the metal element to attract yin water. Yang water favorable elements are earth and wood. Both elements can enhance the yang water when you add them to your décor. Your best colors are blue and black. Use these colors in decorating your home. You can also select clothing in these colors for element power dressing. The fire element can empower you through the use of it in the South (ruled by fire element). This can be in the form of a fireplace and/or candles. You may prefer to add table lamps and floor lamps along with recessed ceiling lights since lighting is always a powerful feng shui enhancer and represents the fire element. You can further enhance the South with the wood elements of the East and Southeast since wood feeds fire. A warm climate is a good fit for you. This element brings passion, impulsiveness, and very high energy. Fire elements have everything they need to support careers and achieve goals. Add fire elements and colors to your home décor and personal attire. Your direction is South with support from the Southeast and East. Use any of these directions for activities, such as sleeping, eating, studying and/or home office location. Yin fire favorable elements are fire and wood. Add these to boost the yin fire element in your home décor. Yang fire favorable elements are water and earth. Add these elements to boost the power of yang fire element. Colors are red, pink, and purple. Use these colors in decorating your home and choosing your fashion style. Green and brown wood element colors will further support the fire red colors. If the earth element guides your birthdate, you can use this element to increase all areas of your life. Crystals, gems and stones are earth symbols that can be incorporated into your home décor and personal wear. Earthenware will ground the earth energy when used in home décor, especially the Northeast and Southwest sectors (ruled by earth element). The fire element creates the earth element and is a way to enhance the earth element. Burn a couple of candles in this sector and/or the South sector (fire element), light the fireplace or add more lighting options. A mountain or hilly region is an ideal location for you to live. Home is an important haven where strength and harmony reign. There is a need for stability and relationships flourish under this element. Reinforce these attributes by adding the earth element to your home décor. The center of the home is governed by the earth element as are the Northeast and Southwest sectors. Use these directions for activities, such as sleeping, eating, studying and/or home office location. Add earthenware, crystals and gemstones to these sectors. Yin earth favorable elements are fire and earth. Boost yin earth by adding fire elements, such as candles, lighting or a fireplace in the South sector. Yang earth favorable elements are wood and metal, so decorate using items that feature these materials. The yang energy can be bolstered by adding wood and metal objects in your décor. Colors are yellow and tan. Use these colors in your home décor and your wardrobe choices. Since fire generates earth, add fire colors to your décor and wardrobe. The metal element rules the West and Northwest and can be activated by introducing metal artwork, furniture, and various metal objects into your home décor. Metal also attracts water, so a water element can also be used to further enhance the properties of the metal element. Mountain regions with ore deposits are ideal locations for you to live. Metal brings the element of vision and clarity. Precision and efficiency follow this energy and helps to create balance in life. The directions for metal are West and Northwest. Add metal objects to these sectors of your home. Don't over do it. Focus on balance. Metal is used to activate the water in the North. Add a metal object to this sector to attract water. Yin metal favorable elements are earth and metal. Add a few pieces of pottery or crystals to represent earth elements. Yang metal favorable elements are fire and water. Add a water element and a representative fire element to support yang metal. Your best color choices are black, gray, and white. Use these colors along with the appropriate colors of supportive elements for the yang or yin metal. Unlike traditional astrology where your birth month plays a key role in important aspects of your life and personality, in feng shui and Chinese Astrology, these factors are determined by the year in which you are born. Elements are important because they help define the chi energy they attract. 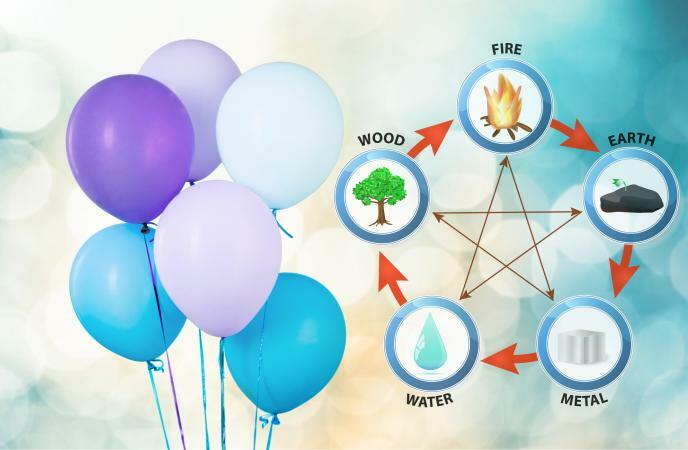 The feng shui elements based on birthday calculations using a Ba Zi analysis can assist you in a better feng shui design for your home, but more importantly, it can provide you with a life map so you can take advantage of opportunities. You can also gain a better understanding of the challenges you will face throughout life based on your strengths and weaknesses, as well as how to correct them using colors and symbols.